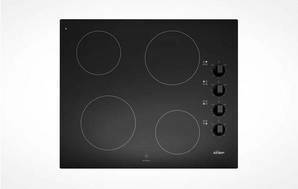 Snapshot: The Simpson SHC644BA ceramic cooktop has 4 elements and dial controls. How well does it cook? Good results in our white-sauce test. Excellent results in our chocolate-melting test. Dial controls with no child lock (controls are along the side of the cooktop but the one closest to the front can be easily reached by a small child). Basic selection of cooking zones (2 simmer and 2 medium), not suitable for pans or saucepans with large surface area. Controls are fairly close to the two cooking zones on right side. Surface may become hot near controls. No number labelling on controls, only "high" and "low". Control knobs can't be removed and can be fiddly to clean around. With ceramic cooktops, we also melt chocolate to measure how well the simmer element/burner maintains the lowest temperature. Price is based on a September 2015 and March 2017 survey.